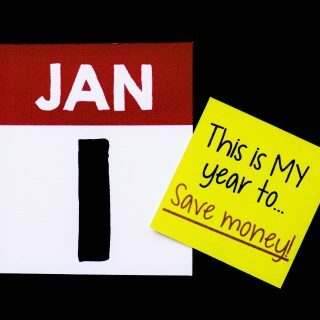 According to U.S. News and World Report, 80 percent of New Year’s resolutions are broken by the second week of February. So, now that you’ve gotten those out of your system, it’s time to exercise your self-discipline in an area that should be more than a once-a-year promise: your financial health. The Federal Deposit Insurance Corporation has offered advice for getting your finances in order this year. These guidelines for achieving long-term financial goals will set you up for success. It can be tough to face your finances, so if it makes it easier, start out with baby steps to keep your plan manageable. Decide what this account will be for, such as an emergency fund, and look for an account that will help you meet your goal. For example, money market deposit accounts offer higher interest rates than traditional savings accounts but require you to maintain a minimum balance. Signing up for direct deposits or automatic withdrawals from your checking account will allow you to just set it and forget it. Start out with a small amount of money and increase it as your comfort level rises. Make a list of what you owe. Include the interest rates, current balances and monthly payments. Determine how you’re going to pay more so you can erase those balances. This may call for some belt tightening, but your financial health is worth it. Start first with the loans that have the highest interest rates. Or you can focus first on the loans with the smallest outstanding balances. Paying those off may give you the incentive to keep going to pay off the larger loans. You can also get started by just increasing one of your payments by a small amount, just as much as you feel comfortable with. Your creditors may be willing to change your billing cycles to align your bills with the timing of your paychecks. A credit counselor can help you figure out how to pay off your debt. Information on finding a credit counselor is available from the Federal Trade Commission. Financial literacy is the key to financial health. Start with a budget to learn how to effectively manage your money. This will allow you to track your spending and create a system to ensure you pay your monthly bills. There are a variety of financial management programs available on the internet. Many of these are low cost — Mint.com, one of the most popular tools, is free — and user friendly. Find one that fits your needs, make your budget, and stick to it. Keep a close eye on bank statements and credit card statements to identify unusual activity or unanticipated fees. One way to save money is to arrange for your bank or employer to make automatic transfers into your savings accounts. Your financial health hinges not only on your discipline in regard to your spending, but also on your diligence when it comes to protecting your accounts and sensitive personal information. Scams are an ugly reality in today’s world, and some populations, including seniors and veterans, are more vulnerable than others. Never provide any credit or bank account numbers to someone who requests them over the phone or the internet. Check your statements regularly and choose easy-to-remember, secure passwords. Suzanne Gellman, a financial education specialist at the University of Missouri offers some additional advice. Make your goals are SMART — specific, measurable, attainable, realistic and timely. Gellman suggests creating a notebook with helpful information for the person in the household who doesn’t manage the finances. The notebook should include emergency contact details and the location of important documents. She also suggests reviewing and updating insurance policies, wills, and advance directives. Advance directives are legal documents, including living wills and powers of attorney, that guarantee your medical wishes are met in the event you are unable to communicate them. Lastly, Gellman encourages you to check your investments to make sure they’re still right for your needs. Consider all your options when reviewing your investments, and always include your retirement plan in your financial review. You may find you would benefit from adding an annuity to your portfolio to guarantee income after retirement.